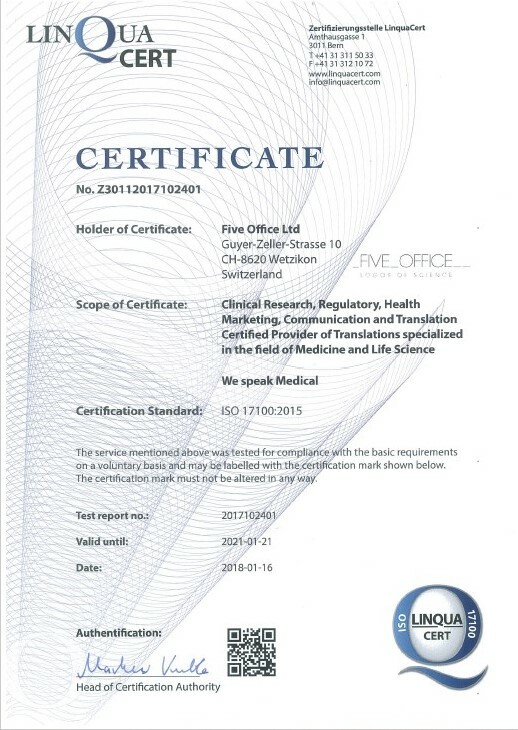 Five Office Ltd is a Swiss Service Provider with a network of over 1000 External Experts mostly Medical Doctors, Pharmacists and Scientists based all over the world. The easiest way to listen or to speak to the international scientific community is a Five Office translation. A translation has to be loyal with respect to the original, meet the highest standards of the specific field of expertise, such as oncology or genetic engineering, and has to be written in a completely professional way. Scientific writers use clear and unequivocal language. At Five Office they write exclusively in their mother tongue. Over 300 pharmaceutical companies, university departments and PR-agencies are Five Office clients. Languages: German, English, French, Italian, all other European languages, Russian, Japanese, Chinese, etc. Translation of scientific information, slogans, websites, manuals etc. We are happy to translate for you one sentence for free. Please indicate the language and the deadline. Profit now from our medical translation service. Every 5th, 15th and 25th of each month, we offer you a price reduction of 5% on translations. Contact us now!